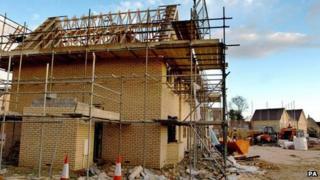 The number of new houses being built in England last year was the highest for six years, government figures show. In total, 122,590 homes were started, the largest number since 2007, and a rise of 23% on the previous year. However the number of homes completed, 109,370, was the lowest since 2010, and a fall of 5% on 2012. Of those built, nearly 13,000 were sold under the government's Help to Buy equity loan scheme, which began in April 2013. The figures were published by the Department for Communities and Local Government (DCLG). The number of homes being built in the UK is still well below its all-time high, which was 425,000 in 1968. Housing charity Shelter welcomed what it called the "uptick" in house-building, but said the country was still building less than half of the 250,000 homes a year it needs. "With thousands of young people and families already beginning to give up hope that they will ever be able to afford a home of their own, this woeful gap between the homes we need and the homes we have spells disaster for future generations," said Campbell Robb, Shelter's chief executive. Last month, Prime Minister David Cameron clashed with Labour leader Ed Miliband in the House of Commons over the number of new homes being built. Mr Miliband said the number of housing completions was at its lowest since 1924. But Mr Cameron said the number of housing starts was at its highest for five years. Typically there is a time lag of up to a year between housing starts and completions - the time it takes to buy land, get planning permission, and build a house. As a result the industry said the rise in housing starts in 2013 would feed through to a "significant jump" in completions later this year. "Like an oil tanker, house-building is not something you can turn around quickly," said John Stewart, the chief economist at the Home Builders Federation. Most of the UK's big building firms are promising to expand construction significantly in the year ahead, partly as a result of the government's Help to Buy scheme. "We aim to open 170 new sites this year," said Jeff Fairburn, the chief executive of housebuilding firm Persimmon. The first phase of Help to Buy, under which buyers take out a shared-equity loan from the government, began in April 2013. The second phase, in which the government guarantees part of a mortgage loan, began in October.